When you make more than a gallon of chicken stock, you have to start branching out and find unique ways to use it up. This recipe really wasn’t planned out, I really just threw together a bunch of stuff we had lying around. The soup end up tasting great though. I had a bag of frozen wild mushrooms, which I bought at Whole Foods, and they served as a base for the dish. I also threw in some random herbs, a bit of old white wine we had and a dash of cream at the end. I didn’t follow a recipe so I am not sure of the exact amounts to add, so keep tasting as you go. The lessons learned are that it never hurts to have a well stocked pantry and don’t be afraid to venture out without a recipe. Melt the butter in a pot over a medium heat and saute the onions. Cook the onions until they begin to get tender, roughly 5 minutes. Add all of the mushrooms to the pot, cook until the mushrooms have defrosted and have begun to brown slightly. Add the herbs and cook for 1 minute. Add the white wine and scrap off any bits that have stuck to the pan. 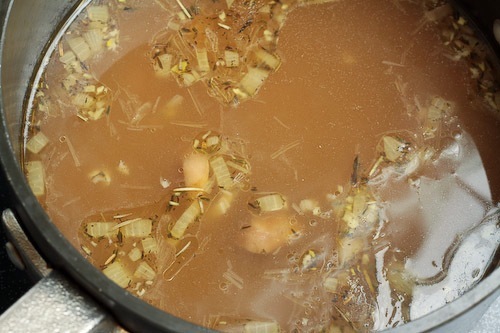 Add the chicken broth and bring to boil. Reduce the heat and simmer the soup for 20 to 30 minutes. 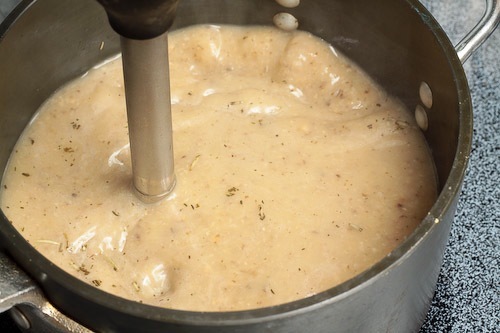 Remove the soup from the heat, and stir in the cream. 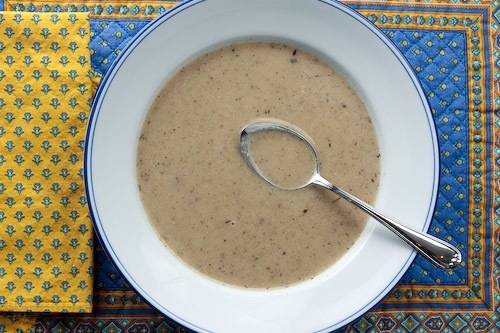 If you have an immersion blender, blend the soup. If you have a regular blender wait for the soup to cool and then blend. Add salt to taste. This is perfect I have a hue batch of chicken stock from yesterday and wanted to do something other than chicken & dumplings or the same old soup. And all this time I thought if you had more than a gallon of homemade stock you were supposed to arrange it prominently in the front of your fridge so you can casually drop phrases like “oh! all this homemade stock!” or “wait, I need to move some of this homemade stock out of the way” and make your friends hate you. I’ve been wrong before. Very true Lisa! We don’t have people over that often so I decided to brag about my “woes” on the internet instead.